Fifty miles a week is pretty nuts. I don’t know what 58 miles in a week is. Marathon training, I guess. 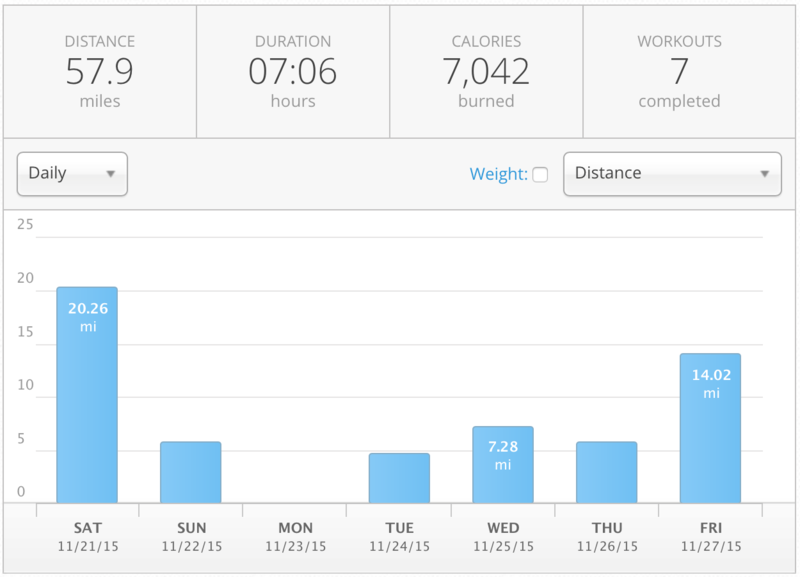 My goal for the next 6-8 weeks is to maintain around 50 miles per week. And eat. Man, I’m always hungry. You have two options: 1) you can empty buckets or 2) you can fill buckets. Choose to fill buckets. We’re lucky in that our 9-year-old goes to an excellent public school in Austin. At 7:30 a.m. every weekday the principal addresses the entire student body in person in the gymnasium. One of the repeated messages is about filling buckets. A simple message to children is very applicable to all ages. In our daily lives we’re either making deposits or taking withdrawals. We’re either giving or taking. In the emotional sense, we’re either lifting someone up, or breaking him down. Filling a bucket is simply making a deposit in someone else’s life. Rendering a compliment, holding a door open, making a conscious effort to do good and abide by the Golden Rule. When you fill a bucket, you’re making a conscious effort to make someone else’s life better, no matter how small the effort or task. You’re choosing to be selfless. When you empty someone’s bucket, you’re taking a withdrawal. You’re invariably breaking him down for your own benefit, if you’re conscious of it or not. You’re being selfish. Breaking someone down can cause immediate and long-term damage to both the receiver and the giver (you). Now you’ve got that scarred inventory in your heart and head until you choose to make it right. And you’ve taken away from someone. Imagine that everyone is carrying with them a bucket that’s not quite full. Do what you can to add to that bucket. Don’t take away. Make someone laugh or smile or blush. A small effort can make a huge difference in a person’s day, and probably make an impact for a lifetime. And make filling buckets a habit. Things that we become really good at become habits. Try to fill five buckets a day. Fill buckets. Read books. Turn off the TV. Put down your phone. Pick up a book and read it. Read it before you go to bed. It stirs the imagination, boosts your vocabulary, clears your mind, teaches you things, and, most importantly, it’s much-needed you time. You’re reading yourself a story. It’s therapeutic. It helps you wind down. Trust me. We got rid of cable television some number of years ago. I don’t remember — I want to say it’s been at least five years, and me, personally, I don’t miss it a single bit. Six plus years ago I started the habit of reading every single night before I go to bed. When it truly became a habit, I asked for a Kindle for Christmas. My kindle is dutifully at my nightstand and travels with me when I won’t be sleeping in my own bed. Can’t think of a book to start with? Try Harry Potter. Seriously. It’s a wonderful, well-written series of stories that’ll turn reading into a habit for you. Then try re-reading those classics that you were forced to read in high school when you might’ve been too cool, or too busy to read back then. You’ll relate to them now. Then ask your friends for book recommendations. Ask me. I have great recommendations. When you talk about books with your friends and family, they’ll always have great recommendations for you because they know and love you. They have a pretty good idea of who you are and what your interests are, often times taking into account your moral compass and imagination. My mother-in-law always loans me really good books. And those are really special gifts because I know she thought of me and wanted to share something that I’d find of great value. I’m reading 20,000 Leagues Under the Sea to my oldest daughter right now. That book will make you realize how most of us have sadly dumbed down our personal prose and conversational vocabulary (or just don’t know any better). I like to alternate the kinds of books that I read. I’ll read a classic novel, and then I’ll read a “fun” novel. Right now I’m reading a “fun” Pet Semetery by Stephen King. I’ve always been a fan of horror. Go to your local bookstore or library. Tell an employee you’d like a book recommendation. Be humble and divulge your interests. Get lost in the books section of Amazon.com. Fun fact: all of the classic novels are free on the Kindle. Read books. Let your mind paint pictures. It’s better than Netflix doing it for you. Stop what you’re doing. It’ll be there when you get back. Get up and go for a walk. And go walk some miles. Put some time and distance into it, emphasis on the time. Go be by yourself and just walk. Mosey and think. Find a trail or walk some unfamiliar streets. Walking gets the blood flowing and promotes good health and posture. And you need a break. And you need to smell the air and hear the birds and see the new architecture and plant life. And you just need to get away from whatever it is that you think is so important. Again, it’ll be there when you get back. What’s really important is you moving and breathing and thinking about what’s really valuable and important in your life at that moment. The walking will help you realize this. A work email isn’t what’s really important. When you’re walking you can think about scheduling a Daddy/Daughter date. Or how beautiful of a woman your wife truly is and how she enriches your life so. Or how you could earn some extra passive income to save up for a nice family vacation, or to double up on the mortgage payment. Or you could just look at those ducks over there and think about what they’re thinking about when they’re just standing there, all ducky. And consider investing in a gadget that helps you track your steps and distance. It’ll be that tangible thing that reminds you to go for a walk. And then you can look at your data and motivate yourself to persist and beat yesterday. Drink water. Plain, good ol’ H2O. Pitch the cokes & coffee. Well, maybe not pitch them, but scale back a bit and augment your liquid intake by drinking some more water. Our bodies are made up of it, and it’s freely available. And it’s good for you. And it fills you up. Always have a cup or bottle next to you to remind you to drink your water. Chug a bunch of water before you eat. It’ll fill you up and you won’t be inclined to eat the huge portion of food in front of you. I’m learning the drinking more water lesson the hard way. I was diagnosed with a kidney stone this past Friday. On Wednesday night I trying laying down in bed, I tried walking around the house, I tried curling up into the fetal position on the floor in our bedroom in a desperate attempt to rid myself of the unbearable pain I was feeling in the right side of my back, just below my rib cage. I finally woke Elise up at 2 a.m. and had her check my temperature because I thought I might’ve had appendicitis. Long story short, the pain I was feeling was a calcium oxalate stone moving around in my kidney. After my CT scan and confirmed diagnosis of a kidney stone, I learned that I get to wait for its “passing.” The cause? Well, thankfully it’s not hereditary (according to my mom). Since I’ve been running so much, I haven’t been hydrating with plain water as much as I should. And I’d been taking a lot of vitamin C supplements in the form of Emergen-C. And spinach. And salt. And nuts. And chocolate. And tea. And animal protein. All of these things are high in calcium oxalate. So, I’ve modified my diet and I consciously drink a lot of water throughout the day. You should drink more water, too. If anything, I’d just like to prevent you from getting a kidney stone. They’re not fun. Since I’ll be reaching the age of 40 in a few months, I figured I’d start writing down things that I’ve learned along the way, and lessons by which I try to live. All of these life nuggets are simple, and warrant not much explanation. Put down your stupid phone. This year I’ve adopted a no phone policy. When I’m in the presence of other people, my phone goes away. I have one of the latest and greatest iPhones, and I’ll probably always have the latest and greatest iPhone. But I consciously avoid having my nose buried in it at all times. I keep it in my pocket. Next time you’re in public, look around. What you’ll notice is all the people who are letting the real world pass them by. And they’re missing time and interactions with their loved ones. When I’m with someone, I no longer have my phone out. It’s in my pocket. Instagram, Snapchat, Facebook and email can wait until you’re taking a poop. Be present. Put your phone away. Your phone will probably be there next to you on your death bed, but it’s not going to cry when you’re gone. Your friends and family will though. Be here for your loved ones right now.